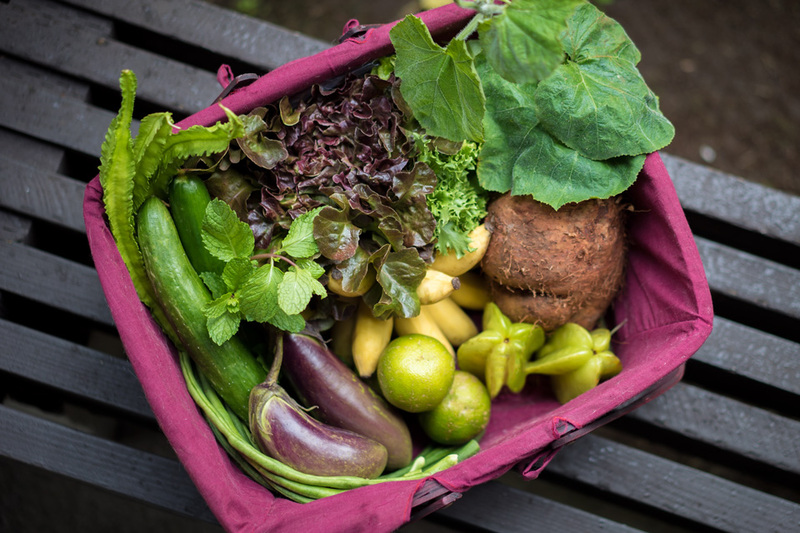 What’s In a CSA Box? 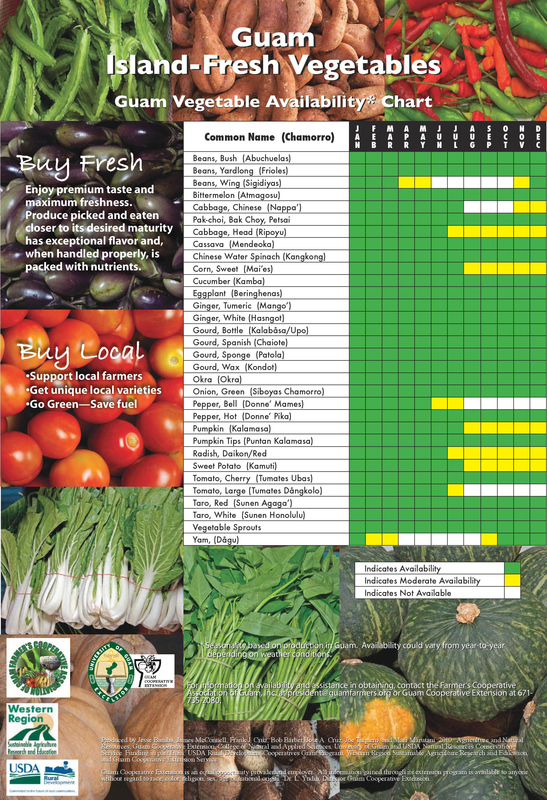 – Farm to Table Guam Corp.
Click here to subscribe to our CSA! 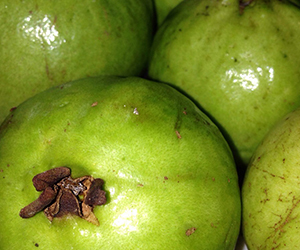 Mountain apple is a crisp and sweet that commonly grows in the tropics. It is very popular in Hawaii where it’s tree is called Ohi’a ‘ai (Oh-he-ah-eye). It is not actually an apple at all. 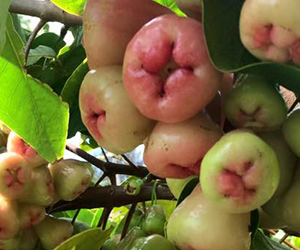 Mountain apple can be eaten fresh, dried, pickled, or made into sauces or preserves. Refrigerate mountain apple in the fruit drawer, will keep for a few days. Mountain apple is a natural antibacterial and antifungal agent. They are also anti-cancerous and contain anti-seizure properties. Arugula has been gaining popularity of late due to its nutrient density, hardiness as a garden plant, and delicious taste. The leaves are characterized as being similar to the leaves of the dandelion plants. Arugula has also been referred to as salad or garden rocket. In hot weather, the peppery arugula flavor has been said to have a cooling effect on the body while also keeping the body hydrated. 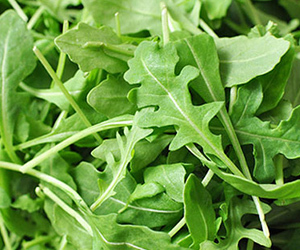 To store arugula, rinse the leaves thoroughly and dry by spinning. Keep in a sealed plastic bag for up to a week. Creamy, rich, and buttery, the avocado has gained increasing popularity for being a superfood. Sometimes referred to as alligator pear or butter fruit, the avocado is rich in vitamins and minerals. Some health benefits of the avocado include the presence of Vitamin K and its role in increased calcium absorption. Also, intake of fat along with carotenoids increases cell absorption of those carotenoids. 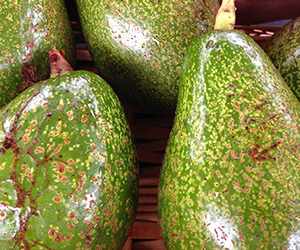 Local varieties of avocados vary in shape, size, and color. Some avocados turn completely purple once ripe, while others remain green. Avocado is a rich source of health fats. We recommend leaving unripened avocado on your countertop until flesh is soft. Once soft, use immediately or store in refrigerator for up to 3 days. When green and soft, use as a starch substitute in soups or stews. When yellow, you can eat them, but aren’t as sweet as “eating bananas.” Common uses include lumpia, doughnuts, and desserts. Potassium intake is important in maintaining low blood pressure. 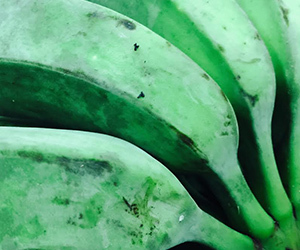 Bananas also come in many shapes and sizes, but the local staples tend to lean toward the smaller manila variety. The manila variety of eating bananas can be only half the size of the widely known chiquita bananas. 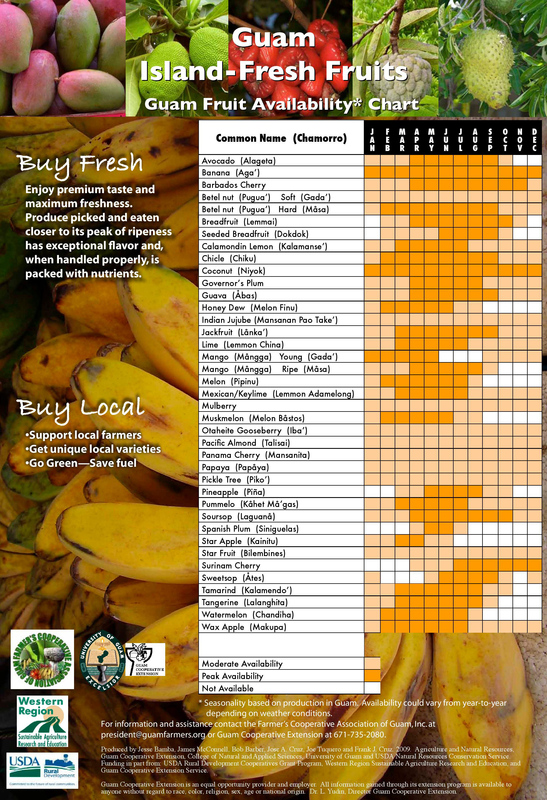 Local bananas have been said to have a sweeter and creamier texture compared to their store bought counterparts. Favorite uses for local eating banana include smoothies, icecreams, eaten fresh, or overripe in banana bread. Leave on counter until ripe. 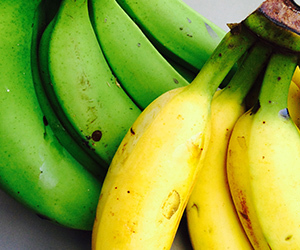 Some banana varieties turn completely yellow when ripe or have yellow and green spots but are soft. Once overripe, the bananas can be peeled and frozen for months. 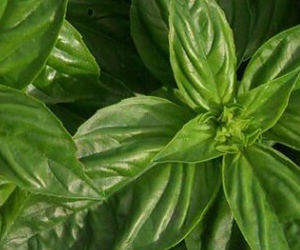 This the best basil for pesto and garlic-flavored dishes. Keep in a sealed bag and store in the refrigerator, will last up to one week. 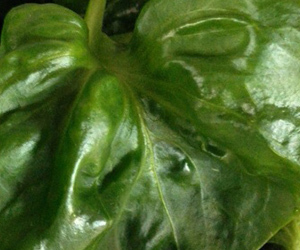 Genovese basil contains high levels of antioxidants. Basil also contains carotenoids like beta-carotene, essential for heart health. Basil also has many medicinal uses such as headache cure and ear infection treatment. Put in open bag, keep in vegetable drawer, lasts about one to two weeks. 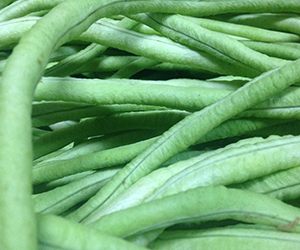 Long beans and most beans in general have high fiber content. Fiber is an essential part of your daily intake. Long beans are also a great source of folates, essential for DNA synthesis and cell division. Also, folate is vital in the diet of pregnant and expecting mothers. Winged Beans are a popular in asian regions and grow year round in the tropics. In Malaysia they are called kacong botol and kecipir in Indonesia. Wash the beans thoroughly in cold water and strain. Trim the tip and ends. Chop beans diagonally into small sections using a paring knife. Winged can be used in a similar manner as peas and other dry beans. Shoots and flowers can also be added to stews or stir-fries. Use fresh or store in the refrigerator for up to 4 days. Fresh bean pods are one of the finest sources of folates, providing up to 16.5% of the daily requirement. They are also a great source of Vitamin C.
Bitter melon is also called bitter gourd or karela. This vegetable is both used commonly as food or medicinally. 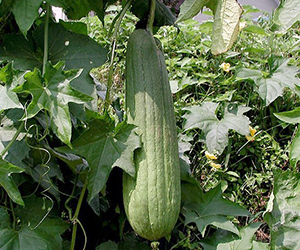 The gourd is related to the cucumber, but tastes nothing like it due to its bitterness from which bitter melon derives its name. In Chamorro, Atmagosu is popular as a pickled side dish. In Asia, bitter melon is popular stuffed, as a part of stews, and stir fries. Its bitterness renders it useless for most other recipes. Bitter melon is touted for its anti-diabetic properties. Store bitter melon in the refrigerator for up to a week. Store bok choy in the vegetable crisper in a plastic zip loc bag or a perforated bag. 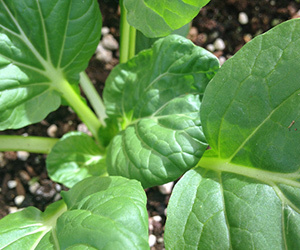 A member of the cabbage family, bok choy is one of the highest nutritionally ranked vegetables. Unlike other cabbages, bok choy also has omega-3s and the anti-oxidant zinc. Bok choy is very popular in mostly asian dishes. Locals love to use bok choy in their soups. 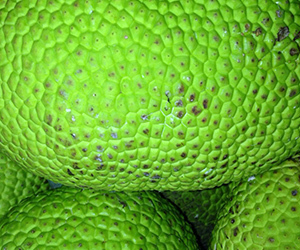 Breadfruit is a staple food crop for many tropical islands, dating back 3000 years. Local varieties of the breadfruit are seeded and unseeded. Locally we like to either cook lemmai in coconut milk which is called “Gollai Apan Lemmai” or grill it. It is used mostly as a sidedish. Be sure to peel lemmai before cooking. We recommend to store breadfruit in the refrigerator up to one week. The skin color will darken while in the refrigerator. Breadfruit is an excellent source of fiber, vitamin C, Omega 3s, and potassium. Good source of vitamins B1 and B6, pantothenic acid, and magnesium. Although cabbage is not commonly grown on Guam, you may find the Napa Valley variety from time to time. 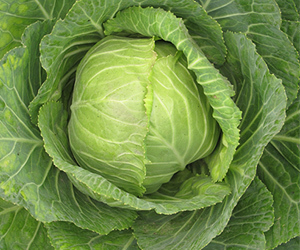 Cabbage is versatile and delicious, used in many different kinds of recipes including coleslaw and cabbage soup. Adding cabbage to your diet can lower your cholesterol. We recommend consuming lettuce raw or steaming it for optimal nutrition. Other popular ways of preparing cabbage include stir frying and boiling in soups. Store lettuce in a sealed plastic bag for up to 2 weeks, some varieties such as savoy will only keep for about a week. This local lemon variety is a favorite in both Chamorro and Filipino dishes. Calamansi is also the name of the lemonade drink that is bottled and sold around the island. Many locals use calamansi as a substitute for lemon in cooking. A favorite is the local condiment called fina’denne’, where calamansi is squeezed and mixed with a bit of onions and hot pepper. This condiment is eaten commonly with fried fish. Keep calamansi in a small sandwich bag in the refrigerator for up to 2 weeks. Calamansi or Calamondin is known for its high Vitamin C content. The phytochemical limonene is known for its potent detoxifying properties and antibiotic effects. Chives are very popular in kitchens and gardens due to its durability and delicious taste compared to that of a mild onion and garlic mixture. Growing chives has been said to be quite simple and has become an extremely popular windowsill herb in many kitchens and home gardens. Chives have gained a bulk of their popularity from its delicious combination with sour cream on a baked potato, but this underestimated garnish packs a lot of nutrition. Just like its close relatives, onions and scallions, chives contain allicin, which reduces cholesterol production. It also has antibacterial, antiviral, and antifungal activities. Chives do have a higher content of Vitamin A than any of their other family members. Eating chives fresh is always recommended, and they can be stored in the refrigerator for up to 2 weeks. If the root is still attached, throw them in a cup of water and see if it grows! Place in crisper drawer, use within a week. 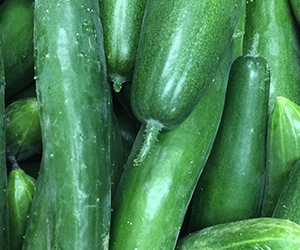 Due to its high content of Vitamin B, cucumbers are a great energy boost alternative to coffee or energy drinks. Include in your normal juicing routine for a pick-me-up and a detox. To store dill, cut off tips of stems and remove wilted leaves, store in refrigerator in mason jar or small container with an inch of drinking water at the bottom. Cover container with a fitted cap of a plastic bag with rubber band. 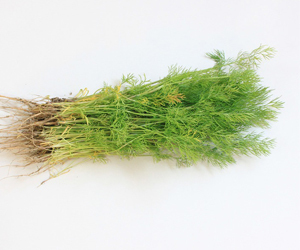 Much like parsley, dill’s volatile oils make it “chemoprotective,” which helps neutralize types of carcinogens. Once the flesh is red and soft, store in the refrigerator for about 2 weeks. 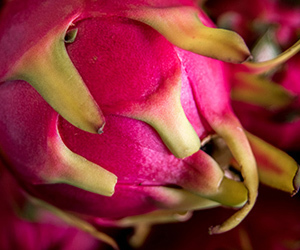 Also known as pitaya, dragonfruit is known for many health benefits including helping maintain cardiovascular health, high fiber content, has many antioxidants, helps fight diabetes, and has a high content of vitamin C. Dragonfruit can be eaten, made into a paste and used as a face mask for acne and anti-aging. If put in the hair, dragonfruit helps hair follicles stay open in order to breathe and remain healthy, great for chemically treated or colored hair. Although chickens have been a part of Guam’s culture for many years, only recently has there been a steady local source of eggs for the community. Local eggs are in high demand, and no wonder why, the quality of eggs sourced locally are evident. Eggs imported from the mainland US take weeks before hitting the shelves at local supermarkets. The result is runny, bland yolks and watery whites. Local eggs on the other hand are characterized by golden yolks and thick, mucousy whites. 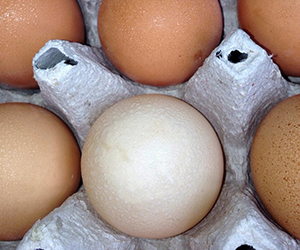 Unless familiar with storing fresh eggs, we recommend refrigerating eggs for about 3-5 weeks. Leave on counter, good for a few days. To freeze, chop and slice, store in zip loc bag. We grow Asian variety with thin skin, suitable for both Italian and Asian recipes. 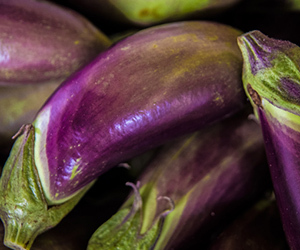 A potent antioxidant and free radical scavenger shown to protect cell membranes from damage is found in eggplant. Nasunin has been found to protect the lipids (fats) in brain cell membranes. 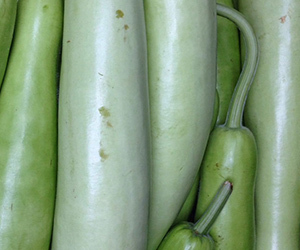 The bottle gourd is another popular Filipino vegetable. This vigorous climbing vine varies in shape and size depending on the variety grown. Commonly found on Guam is the upo/opo variety. 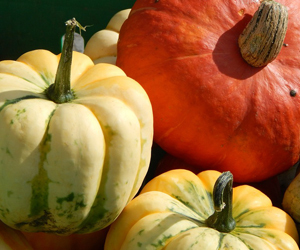 It’s often called a squash, however it’s actually part of the gourd family. 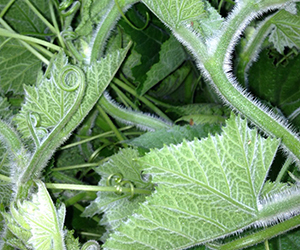 The young green fruits are consumed in soups similar to squashes or other gourds. The older, dried fruits form hard wooden shells and are used to make bottles (hence its name). Upo gourd contains calcium, magnesium, phosphorus, Vitamins A and C, and folate. We recommend storing the gourd on the countertop until ready for use. 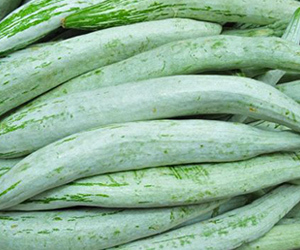 The snake gourd is grown for its medicinal, edible, and ornamental properties. The gourd has been eaten in Indian and Asian cultures for hundreds of years and has also been introduced to many American gardens. The gourd is usually sliced in half, the seeds scooped out, and sliced further into smaller pieces. The gourd is used commonly in soups, salads, and curries. It can also be stuffed, fried, or baked like a zucchini. The snake gourd is touted for its medicinal value. It is an all-natural antibiotic, expectorant, and a laxative. It it said to have a cooling effect within the body. It is also a heart tonic. This vegetable is well known in the Asian, African, and Arabic nations. Commonly known as loofah or luffa. The fruits must be cooked before hitting maturity or else its insides will take on woody, fibrous characteristics and creating the loofah sponge we all know and love. Peel the loofah and remove seeds, if desired prior to cooking. 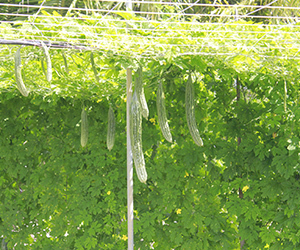 Young loofah gourd is commonly used in stir fries or soups. Loofah has been touted as an excellent blood purifier. It acts as a liver booster and can decrease the side results of alcohol intake. Store loofah in the refrigerator until ready to use or up to 4 days. 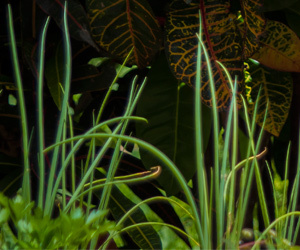 Green onions or bunching onions can be any variety of onion, harvested before the bulb is grown. Green onions are enjoyed raw most of the time, but can be a surprisingly versatile. Also green onions hold a lot of hidden nutritional value. Some of these include, the improvement of bone density, aid in respiratory function, as well antibacterial and antiviral properties. Store green onions in plastic bags for up to 7 days. Careful not to store onions near odor-sensitive foods just like corn or mushrooms. If the root is still attached, throw them in a cup of water and see if it grows! You can tell if Guava is ripe either by the smell or if the skin is slightly soft to the touch. Different varieties of Guava have white, pink, or red flesh. It can either be eaten while green and hard or when flesh is soft and ripe. Some people also pickle slightly ripened guava. Careful of eating the seeds and center of the guava, for it may cause constipation. This is actually a local remedy for diarrhea or runs. Guava is helpful to any weight loss diet plan as it satisfies the appetite easily while being very nutritional. Store in cool, dry place (on counter or in fridge). To freeze, wash them, pat dry, and place in zip lock bag. Optional: cut into chunks before freezing. 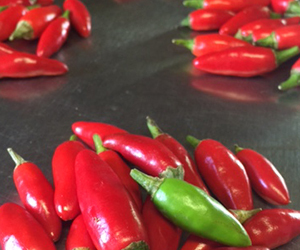 Capsaicin is the active ingredient in peppers that makes them hot. The hotter the pepper, the more capsaicin it contains. Capsaicin has been shown to cause cancer cells to commit suicide, especially that of prostate cancer. Tie bag, keep in vegetable drawer, lasts about one to two weeks. Or rinse, spin and cut lettuce. Store in covered container, lasts for about a week. Nutritional Facts: Kale is one of the most nutrient dense foods. Adding kale to your diet can greatly increase the nutrient content of your diet. Rinse and spin, store in covered container or glass bowl, lasts a few days. Kang Kong can be eaten raw, but is recommended to be cooked. Kang kong is said to be rich in iron, calcium, phosphorus, carotene, sitosterol, protein, vitamins A, B1, and C. Also contains many health beneficial amino acids. An abundance of local lemon varieties exist. Most local lemon varieties are green, looking more similar to storebought limes. Depending on the variety the flesh may range from a lime green to a deep orange. The flavors also range from bitter sour to sweet sour. The local lemons tend to be more tart and juicy than their store bought counterparts. Store on counter or in fridge, lasts about a week or two. Good for juicing or freezing juice in ice cube trays. As its name implies, it is a variety of grass. 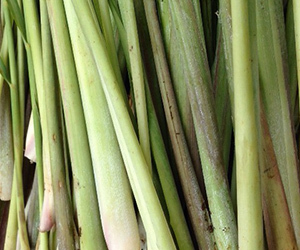 Therefore, once the lemongrass shoots reach about a foot long, they are ready for harvest. 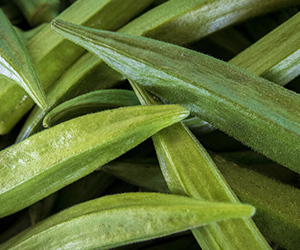 Lemongrass can be used immediately or if desired, frozen for up to a year long. When prepping for freezing, chop the leafy part of the lemongrass, this part can be used for teas. The bottom shoot is primarily used as a spice in soups and curries. 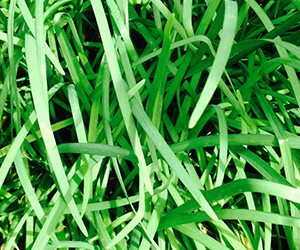 The properties of lemongrass have been seen to help the production of serotonin. This naturally occurring chemical in our brain helps combat depression and induces sleep. Also known as deer tongue lettuce, grows in tight clusters with long triangular green leaves. 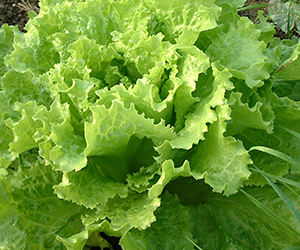 Bibb lettuce becomes more bitter as it matures, but the flavor has been described as mild. Rinse lettuce and wrap in paper towel. 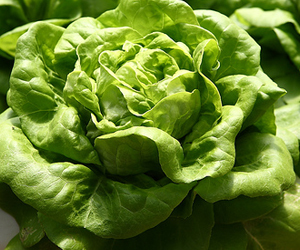 Store lettuce in the refrigerator in sealed plastic bags. Will keep for up to a week. 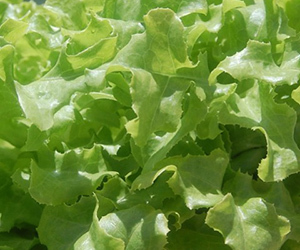 Lettuce is great way to get your dose of vitamin and minerals in a salad or sandwich. 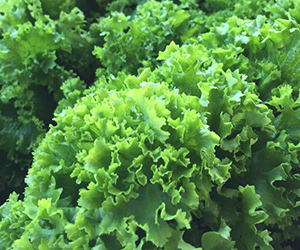 With its curly green leaves and Italian origins, Lollo Bionda is more than just a cool-sounding lettuce, it’s also really tasty! Soft, sweet and yet crunchy, it’s the perfect green to spruce up any salad. 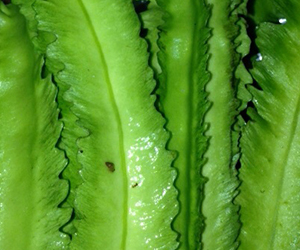 Lollo Bionda’s frilly leaf edges add texture and a great presentation to any dish. Frying, grilling or roasting meats or fish? Lolla Bionda is the perfect complement, in appearance and taste! See nutritional value here. Oak leaf lettuce is a type of butter lettuce whose leaves are distinctively lobed. It can be used as a border accent in a garden and is found in a variety of red and autumn shades. Oak leaf can also be used as a garnish or can be cooked or stuffed, separated into leaves or served as mature hearts. Rinse and spin, store in covered container or glass both, lasts a few days. 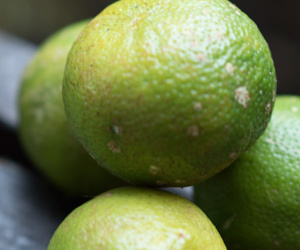 The lime is actually a hybrid citrus fruit. 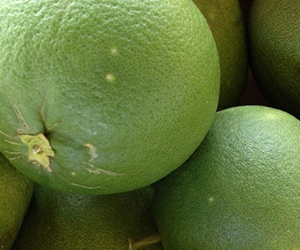 Local varieties of lime are characterized by thick, green rinds and bright green pulp. 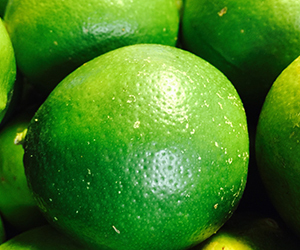 Limes are usually smaller and less tart than lemons. They are another great source of Vitamin C. We recommend to store limes in the refrigerator for a few days or on the countertop until ready to use. There are many varieties of mangos found on Guam. 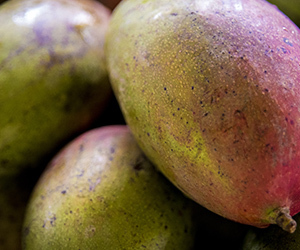 Most mangos turn either a yellow or reddish tinge when ripe. All are soft, and the flesh is golden yellow and sweet. 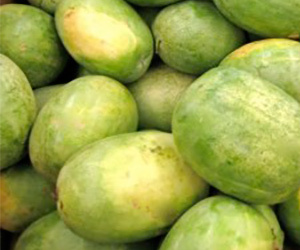 Mango can also be eaten green and is popular pickled or in salads. Depending on the variety, when ripe, it is preferable to peel the skin off before eating, but the skin is edible. Mango is definitely a local favorite. 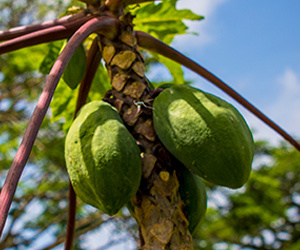 We even have a mango festival annually in the village of Agat and one of our partner farms Christian’s Mango Farm grows exotic varieties such as carabao, Indian, King Edward, papaya, and a few others. Visit his profile for more info. Mango is a great source of vitamin C and other antioxidants that are great for your skin. You can also use mango in homemade face masks or scrubs. Becoming increasingly popular lately, Microgreens are the tiny sprouts of vegetables allowed grow only a few inches before consumption. Popular microgreens include, leafy vegetables such as kale or lettuce and herbs. Microgreens are not sprouts, although similar. 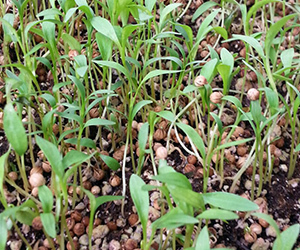 Microgreens are allowed to develop longer than sprouts giving them a much more pungent flavor and density. Growing microgreens also differs greatly from that of sprouts. Not only to microgreens look and taste great, they are also packed with nutrients. Studies have shown that microgreens actually contained far more nutrients than their mature counterparts. Microgreens should be rinsed, wrapped in paper towel, and stored in the refrigerator for up to 3 days. Use in salads, sandwiches, as a garnish, or juice them for a quick shot of vitamins. 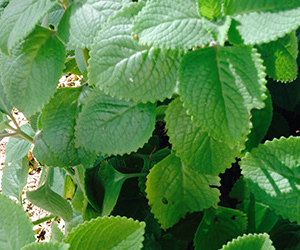 Mint is another home garden favorite and can make any dish taste refreshing. Mint has many health benefits, including its use as a digestive aid. Mint is used as an appetizer and a palate cleanser. It’s very popular as a tea. It also helps when you are feeling nauseous and have a headache. Those who travel have said mint tea has eased their motion sickness. Mint is also a natural stimulant helpful for those who need a quick pick up throughout the day. 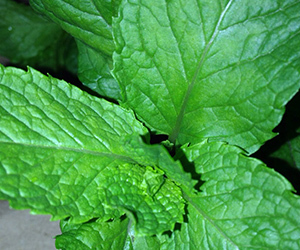 Store mint in a plastic bag in the refrigerator for up to five days. Mizuna is a mild to moderately spicy garden green very popular in Japanese dishes. Popular uses of mizuna include salads, soups, and stir fries. Any recipe calling for mustard greens or cabbage can be substituted with mizuna. Farm to Table Guam grows a variety of mizuna called Lime Streaks, both in a red and green variety. The flavor has been compared to that of a mild horseradish. 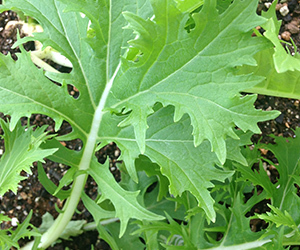 Choose mizuna with fresh, bright, and green leaves. Rinse and wrap leaves in paper towel and store in the refrigerator in a plastic bag. Mizuna will keep for up to 5 days. Mix mizuna with other salad greens. It is also great in soups and stir fries. Mizuna is high in immune boosting vitamin C, folate, and iron. It also contains glucosinolates, which are antioxidants linked to decreased cancer risks. The popular medicinal tree, the Moringa plant has been consumed for ages, especially in many cultures including African, Indian, and Filipino. 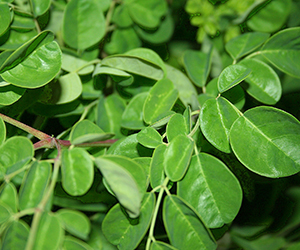 The moringa tree is also referred to as the Drumstick Tree by the British. This tree is a multipurpose plant whose leaves, pods, fruits, flowers, roots, and bark are beneficial in one way or another. One of the most significant benefits of malunggay is its amino acid content. Studies have shown malunggay’s bark, leaves, seeds, and flowers contain the essential amino acids that act as the building blocks for tissues. Store in the refrigerator in a cup with half an inch to an inch of water for the stems, similar to a bouquet of flowers. The Malunggay leaves will keep up to two days. Popular uses include as an ingredient in soups, teas, and hair and skin products. Try to use immediately after picked. Mustard greens are the leafy part of the mustard plant. They are popular in southern, Indian, Asian, and African dishes. 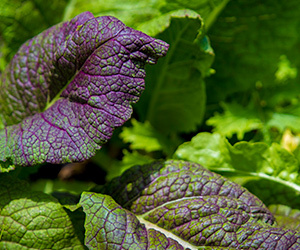 Many varieties of mustard greens exist, however local varieties include Florida broadleaf and red giant. Many people dislike the peppery, pungent flavor of mustard unfortunately. Yet, mustard is rated high as one of the most nutritious greens, especially for its work at lowering cholesterol. We have also featured microgreen mustards that are milder in flavor. Boiling or braising mustard greens seems to lighten the flavor. We recommend storing mustard greens in a sealed plastic bag in the refrigerator for up to a week. This variety has spineless, tender ribbed pods with excellent flavor. Best in soups and stews. Can be canned, fried, roasted or boiled. Cream-colored flowers are edible. Deep fry the flowers or eat them stuffed, or use fresh as a striking, exotic-looking garnish. Sweet and mild flavor. Okra is a high-fiber food, attributing almost half of its nutrition to soluble fiber. Okra is also high in antioxidants and is also a great source of calcium. Locally, common oregano is grown as well as the large flat leaf variety. Fresh oregano should be rich in green and not limp at all. Store in the refrigerator in a sealed bag with a slightly damp paper towel for up to a week. Also, storing whole oregano stems in water with a plastic bag tented over will extend the life of the oregano. Oregano has many medicinal properties including topical uses as an antibiotic or antibacterial for minor cuts and burns. Tea made from the leaves can have a soothing effect and help treat anything from colds, indigestion, and mild fevers. The bright orange sweet flesh of the papaya is a staple for many local diets. 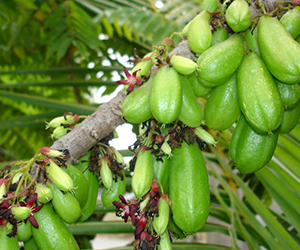 The trees grow wildly on Guam, and many varieties are propagated in back yards and farms. Papaya is consumed ripe and unripe in a variety of dishes. Fresh, unripe papaya (green) is popular pickled. Unripe papaya can also be cooked in soups. Ripe papayas are enjoyed fresh, in smoothies, or candied. We recommend placing unripe fruit on the counter until ready to use or allowed to ripen. Be sure to check what variety you have first- as some stay green and will not ripen. If ripe, store in the refrigerator for a week. Parsley is a favorite kitchen spice and has been called the most popular herb in the world. 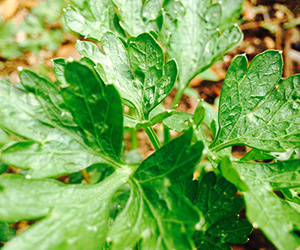 The most common variety of parsley is the curly leaf variety. Another popular variety is the Italian flat leaf parsley known for its strong flavor, which is grown locally. To store parsley, cut off the tips of the stems and remove any wilted leaves. Keep in the refrigerator in a mason jar or small container with an inch of drinking water at the bottom. Cover the container with a plastic bag and a rubber band or with the fitted cap. The volatile oils contained in parsley have been studied to inhibit lung tumor growth. Known in Asian countries as Bilimbi, this tropical fruit is close relatives of the carambola or starfruit. They are very different in appearance and taste. The flesh of the local pickle, is soft when ripe. Yet even when ripe, the flesh remains extremely sour. Local Pickle is popular in the Philippines in dishes such as Sinigang (Sour Soup). Bilimbi is also made into a refreshing lemonade type beverage. Bilimbi has many traditional medicinal uses. The beverage cools fevers and in Japanese culture, mashed bilimbi is applied to skin to rid acne or rheumatism. Store ripened bilimbi in the fruit drawer for up to a week. These large citrus fruits may look daunting, but are a refreshingly sweet treat for anyone willing to get their hands a bit dirty. Similar to a grapefruit, but a bit sweeter, pomelos are loaded with nutrients. Cut the pomelo into segments and use your fingers to peel the white membranes away from the pink pulp. 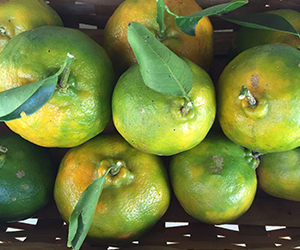 You can eat the pomelo fresh or use the pulp in other recipes such as marmalades or salads. Pomelo is great for hearth health, it is high in potassium and Vitamin C. It is also abundant in pectin, which clears the arterial deposits in the body. Leave on counter. Good for 1-2 weeks. Pumpkins are a rich source of Vitamin A, the anti-oxidant beta-carotene, and potassium. Regulating your body’s sugar metabolism is the best way to manage diabetes symptoms. Both the B-complex vitamin and pectin content of squash help blood sugar regulation and metabolism in the body. Pumpkin tips are, as their name implies, the tips of the pumpkin creepers. The leaves are typically used locally in soups or stir fries. They are especially delicious when stir fried with some oil and garlic. We recommend to use immediately after picked or to submerge the ends in an inch of water and refrigerate for a couple days at the most. When ready to use, slice in short lengths. We recommend to remove the “strings.” Simply start peeling the stringy skin of the stems. If desired, you can also remove the fuzzies with a paring knife. Again, all parts are edible – just depends on preference. A good, easy growing local source of vitamins, minerals, and antioxidants. When choosing a radish, ensure the skin is shiny, firm, and smooth with crisp roots. 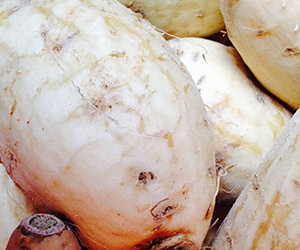 The most common type found on Guam is daikon radish. This radish is long and white and is popular in Asian dishes. 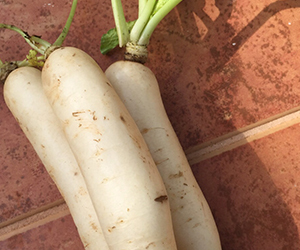 For daikon radish, we recommend to wrap tightly in plastic and refrigerate for up to 3 days. To prepare, rinse and pat dry. Chop off the leafy area and the bottom of the radish. Peel the radish with a potato peeler and chop into the desired size for your dish of choice. Daikon is commonly used in Japan and other asian countries as a digestive aid. The juice of the raw daikon is high in digestive enzymes, similar to the ones already present in the digestive tract. This sweet and sour fruit is very popular in the Philippines and Indonesia. The flesh is used to make refreshing beverages or used in a variety of savory dishes. 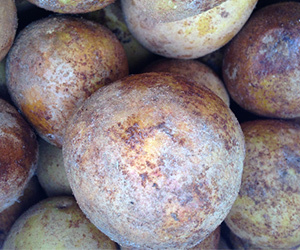 Santol is also often eaten fresh with or without the skin. This fruit is rare on Guam, yet seems to grow well due to climate similarities. We recommend storing unripened santol fruit on the counter until softened. Once soft, refrigerate for up to a week. 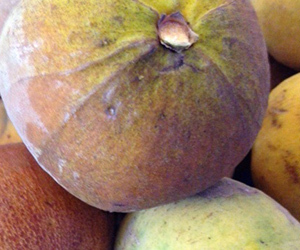 An interesting health benefit of santol is its stimulation saliva, reducing tooth decay and lowering bacteria levels. The spongy, sweet chiku fruit is a favorite in filipino and asian cuisine. The fruit is ripe when the flesh is soft to the touch. Chiku is enjoyed fresh or in milkshakes and icecreams. Store ripe chiku in the fruit drawer of the refrigerator for up to a week. Not only is chiku very tasty, it has many health benefits. The high amounts of sucrose and fructose give a burst of energy when eaten. Chiku is also very high in dietary fiber and can be used as a natural laxative. Chiku also contains tannins. Tannins are known to be effective as an antiviral, antibacterial, and an antiparasitic. Soursop is ripe when it is soft to the touch. If unripe, leave on counter. Once softened, store in refrigerator. Will keep for up to two days. Soursop is low in fat, cholesterol free, sodium free, a good source of fiber, vitamins C, B1 and B3, potassium, magnesium, and copper. The seeds are toxic so be sure to remove all. The mature leaves can be boiled and made into a tea, however drinking on a regular basis has been said to cause health issues. Contact Amot Taotao Tano Farm to learn more. 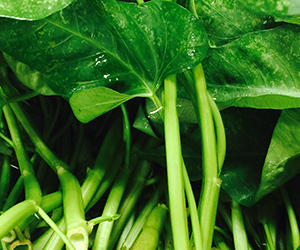 This delicious tropical leafy green grows extremely well in hot climates. The plant itself enjoys full sun exposure and is extremely hardy. 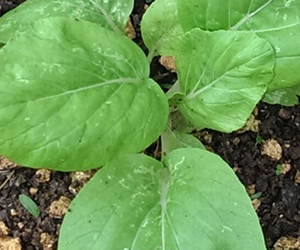 This particular plant is referred to as Sissoo Spinach, Sambu Lettuce, or Brazilian Spinach. Our local farm partners, the Iriartes are our main suppliers of this delicious spinach. Although the leaves can be consumed raw, in smoothies for example, we recommend cooking them for a more enjoyable taste and texture. Use the spinach as soon as possible, however if you need to store it, place on the counter until ready for use. The leaves tend to blacken in the refrigerator. 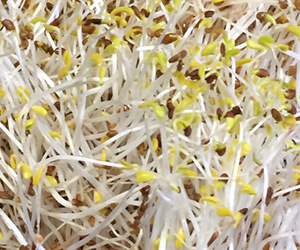 Store alfalfa sprouts in the refrigerator in an airtight container with a bit of paper towel on the bottom to soak up excess moisture. Will last about a week depending on the freshness. Alfalfa is said to be a significant source of phytoestrogens that help reduce the risk of heart disease, cancer, osteoporosis. Also may help reduce the presence of bad cholesterols. Also called Carambola, starfruit is a popular fruit in the tropics. If still green and hard, leave on counter until slightly yellow and soft. Once soft, store in the refrigerator for a few days. 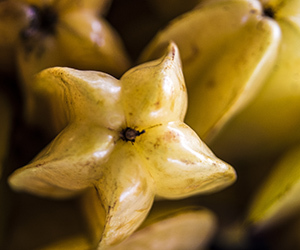 Starfruit can be eaten like an apple or sliced and pickled. A single one cup serving of star fruit has about 40% of the daily value of Vitamin C.
The sugarcane plant is actually a type of grass. The stalks are allowed to mature then harvested. The stalks are cut down into thinner strips and either chewed or juiced. Juice with a good quality juicer to ensure the greatest output and least waste. The juice can either be drank immediately, stored in the refrigerator, or frozen. 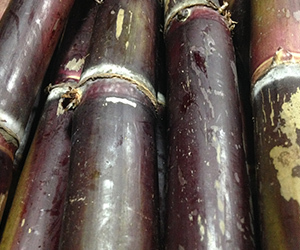 In order to receive the most benefit from sugarcane, it is evident to consume the juice immediately after juicing. Sugarcane is an alkaline forming food due to its high concentration of calcium, magnesium, potassium, iron, and manganese. Sweet potatoes are tubers that are sometimes also called yams in some parts of the world, but can become confused with the local da’gu or nika yams, which aren’t tubers. Purple and white sweet potatoes are grown locally. Store on counter, lasts for 1-2 weeks. Sweet potatoes are a great source of magnesium, which is great for healthy artery, blood, bone, heart, muscle, and nerve function. Magnesium is also the relaxation and anti-stress mineral. More commonly known on the market as custard apple or sugar apple, sweetsop is the sugary version of its close relative soursop (hence the name). 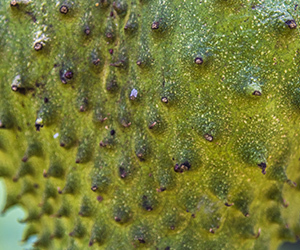 This green, pine-cone shaped fruit grows in the tropics on a deciduous tree of up to 20ft. 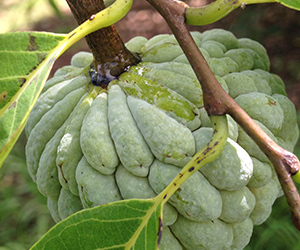 Sweetsop fruit is ripe when its flesh feels full and is soft to the touch. Consume or refrigerate the ripe fruit immediately. It will keep in the refrigerator for up to 3 days. The fruit can also be picked when still hard and unripe. As long as the fruit is showing signs of slight ripening, the skin will take on a pinkish hue or turn red depending on the variety. Sometimes there are dark spots on the skin but the inside is just fine. Sweetsop is very high in vitamin C and vitamin A. Sweetsop can also help indigestion due to its dietary fiber content. Local varieties of tangerines vary in size, shape, and color. Common names for the local varieties include honey tangerine and local mandarin. Some are dark green while others are yellow – green. 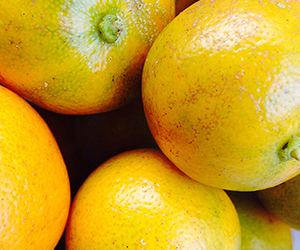 Most local tangerines are picked ripe and enjoyed fresh. They are a bit more tart than the variety found in grocery stores. Other uses for the local tangerines include use in juice recipes, marmalade recipes, and other common citrusy desserts. The peels of the tangerines can also be soaked in vinegar for a cleaner. Tangerines are an easy way to get the needed daily dose of vitamin C.
Select taro roots that are firm and heavy for their size and free of blemishes. Young taro leaves can also be cooked and eaten. Store in a cool, well ventilated area, not in the refrigerator. Use taro as soon as possible, it does soften quickly. Taro is commonly used in soups as a starch. Taro is also a good soup thickener. The longer the taro is boiled, the thicker your soup will get. Wear gloves when preparing taro. The oxalates will cause minor skin irritation prior to cooking. Taro is rich in potassium, contains magnesium, phosphorus, and iron. 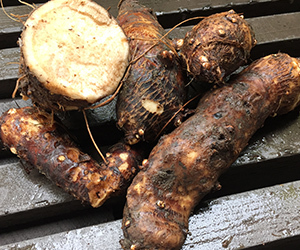 Many varieties of taro are sold and go by names such as Suni, Red Taro, Sunin Honolulu, etc. A very versatile green, can be sauteed or eaten raw. Tatsoi is high in calcium, iron, and potassium, this leafy green is an excellent choice for those who’d like to strengthen their liver, blood and bones. Rinse the leaves, roll them in paper towel, and store them in a plastic bag. Will keep in the refrigerator for 3-5 days. 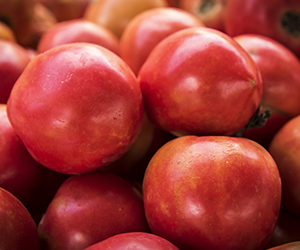 Tomatoes vary in color, shape, and size but the most common tomatoes grown locally seem to be in the cherry, roma, or grape variety. Store tomatoes in the refrigerator in a sealed bag or container for up to 4 days. Tomatoes are extremely popular and uses for them include as a part of fresh salads, in soups, tomato sauces, and in ketchup of course. Tomatoes are an excellent source of vitamin C and and other antioxidants, tomatoes can help combat the formation of free radicals. Lycopene is also present which has been linked to prostate cancer prevention. Store in crisper drawer or leave on counter (if not too dry) – will last for about a week. 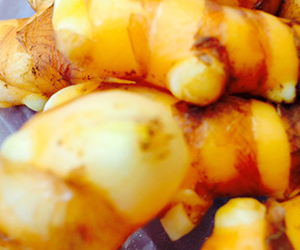 Turmeric or for anti-inflammatory (pain-killer), carminative (gas-relieving), anti-oxidant, and anti-cancer properties. When choosing a ripe watermelon, look for the area where the watermelon rested on the ground. The color should be a creamy yellow. The watermelon should also feel heavy for its size. A whole watermelon can be kept in the fridge or on the counter for up to three weeks. After you cut it, cover with plastic wrap and it can be kept for up to three days. It is recommended to snack on watermelon prior to an intense workout to help reduce next-day soreness and elevated heart rate. Yams are a starchy tuber of West African origin. This carbohydrate rich crop of the tropics has become a dietary staple for many islands. The leafy part of the yam plant is actually an attractive looking vine. Yam grows wild locally and has lost popularity as a dietary staple due to its intensive harvesting. 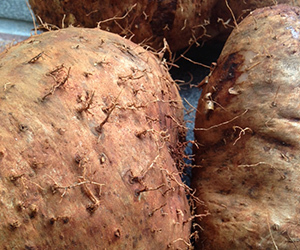 Common local varieties of yam include da’gu, also known as the greater yam or winged yam. Da’gu is used for the popular yam donuts called bunelos da’gu. Another local variety, nika also known as lesser yam, is quite popular. The nika has a milder taste to it and its flesh is more crisp and white compared to the da’gu. Nika can also be used to make donuts, but can also be boiled, mashed, or baked similar to other starches. We recommend to store tubers (roots) on the countertop for up to 2 weeks.